The Dasara Hall with Throne, Palace, Mysore. bl.uk > Online Gallery Home	> Online exhibitions	> Asia, Pacific and Africa Collections	> The Dasara Hall with Throne, Palace, Mysore. 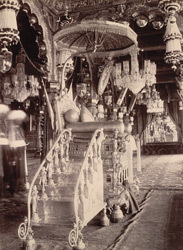 This photograph of the Dasara Hall with throne, Mysore Palace taken in the 1890s by an unknown photographer, is from the Curzon Collection's 'Souvenir of Mysore Album'.The note with the photograph reads, "This throne is one of the articles of interest in the palace. The original structure, which was of fig-wood overlaid with ivory, is generally stated to have been sent by Aurangzeb to Chikka Deva Raja in 1699. The Palace legend, however, runs that it had once been the throne of the Pandus, that Kampula Raja brought it thence and buried it at Penugonda, from which place the founders of the Vijayanagar Empire, to whom its locality was revealed by an ascetic, recovered it, and that it was handed down from dynasty to dynasty until it came into the possession of Raja Wodeyar. It is certain that the ivory throne was used by Chikka Deva Raja and his successors up to the accession of Tipu Sultan, and that, after the downfall of Seringapatam, it was employed at the Coronation, by the British, of Krishna Raja Wodeyar III."